Polythene scraps have drastically disturbed every man's lifestyle in the valley. This appalling amount of trash remains scattered in every street and mohalla. We spend a sizable chunk of money to keep our homes clean but we forget about our environs. Enough is enough! We need to be disciplined and we must cultivate civic sense to save Kashmir from this disaster. In order to fight the peril of polythene pollution, the government institutions and social reformers should come up with laws and ideas that restrict the use of polythene all over the valley. These 'bags of trouble' have already posed a new treat to an environmentally lawless place like Kashmir which is already suffering from the menace of water pollution and various other kinds of misfortunes. Environmental groups say that without awareness among people and tough legislative laws, it is very difficult for the government to attain any success in its fight against polythene. A vigilant public opinion can only fight the problems arising out of the use of polythene, for which we all must owe responsibility seriously. We should perform consecrate duty towards this burning problem. Tons of polythene is imported in the valley every 6 months. Foreign currency is spent by the country for importing the raw materials to create the bags, yet very few jobs are generated by their manufacture, whereas natural products such as paper bags would require no foreign currency expenditures and would create far more jobs for people making the products. Polythene poses the highest threat to environment because they are not bio-degradable; they block drainage systems; limit the air to pass through the soil; disturbs the ecology and it also effects micro-organism life.The main reason for an alarming usage of polythene bags is that it comes for free. Shopkeepers blindly hand out polythene bags, little caring about its adverse effects. 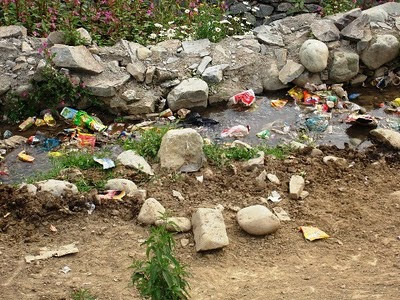 Pollution free town is an aware citizen's first desire.The implementation of this policy should be genuinely supported by all sectors of society, even industrialists and business tycoons.If we look around the landmark places of Kashmir like Pahalgam,Gulmarg,Yusmarg,Harwan area and the Dal Lake area, we will notice that the sewage disposal installations are very mismanaged,no proper initiatives have been carried out in order to restore the green verdure of our environment. If the relationship is strong, often government officials will tell us what we should not move the issue forward. It is important to remember that relationships with government need not always be confrontational! An advocacy campaign is not over when the law is passed. Working for enforcement is just as much the responsibility of civil society as is working for law passage. When laws are not enforced, the very concept of law is weakened, and governments will sometimes neglect their enforcement duties if pressure ceases. The media pressure that resulted in the law could result in enforcement if civil society continued to highlight the problem to the degree it did before the law was passed. Masses should work at building stronger relationship with policymakers. This would involve identifying appropriate people in government, meeting with them, writing letters, making phone calls, and sending newspaper articles and publications. Campaigners should involve experts, teachers, students, and other social workers to emphasize different angles and gain wider involvement in their movement. Nature is the best teacher. If we neglect nature, we won’t have a chance to regret.